With the cooler weather finally upon us I've had time to turn my attention to the Red Hot 20 project. 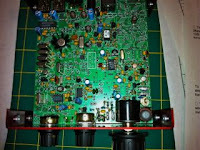 I'm coming up on the 50% completion point and am currently working on the receiver section. The VFO, Audio Frequency Annunciator (AFA), and keyer have been assembled and function tested; happily the magic smoke stayed in all the components on power up. One of the really nice things about this kit is the way the designer, Dave Fifield AD6A, thought about the builder. The radio goes together in stages with power-up and performance checks along the way so there are no surprises when the rig is finished, you know it will work. I had a small solder bridge on the pads of the switch that controls the keyer which caused it to stay in command mode and I was easily able to find the problem and fix it because there were so few components on the board, it made troubleshooting a breeze. When I get to the receiver alignment portion of assembly, I intend to produce a YouTube video of the procedure to aid others who might be building this rig or happened to acquire an already built one. I'm going to use an audio spectrum analyser program on my Mac to set the BFO sideband and check the filter shape. I learned this technique building several Elecraft K2s and once you understand the concept it works very, very well. Unfortunately I don't currently own a calibrated signal generator, it would be nice to check to see if the Minimum Discernable Signal (MDS) in my built unit is as good as the radio's specification (-135 dbm which puts this rig's receiver in the same class as an Elecraft K2). December 1, 2011 I am pleased to announce that Hendricks QRPKits has purchased Red Hot Radio Company, owned by David Fifield, AD6A. With this purchase, I now have the exclusive rights to produce and sell all of the Red Hot Radio Kits, including the Red Hot 40, the Red Hot 20, and the SMK-1. Red Hot Radio produced some of the highest quality kits for several years, but was closed due to Dave not having the time to run the company because of his day job. Now, those kits will again be available. The first kit that I will bring back online is the Red Hot 40, and it is available for shipping now. There are 35 kits in the first run, all on 40 meters. The next kit will be the SMK-1 which will be available in about a month. I encourage you to go to the website, www.qrpkits.com and check out the manual for the Red Hot 40. The kit will sell for $250 plus shipping and handling. And the kit is in stock and available for immediate shipping. If I can manage my time well, there is a possibility that the Red Hot 20 will be completed in time for the G-QRP club's "Winter Sports" activity. It's a non-contest that runs from Christmas to New Years to encourage QRP ops to get on the air; with the current level of sunspot activity working Europe on 20 meters QRP should be easily achievable. Radioman 1st Class Jack Zaruba in the radio shack aboard the USS Acokeek, circa 1947. 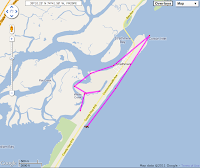 I went kayaking yesterday with my friend Bill and decided to bring my Kenwood TH-D72 APRS radio along for the trip. My usual rule is never bring anything in the boat you can't afford to lose, but I was making an informed exception here. I really like the D72, it performs well, has a built in GPS receiver, and the user interface is very straight forward. 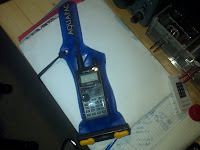 Unlike the Yaesu VX-8DR, the Kenwood is not water-proof so I used an AquaPac vinyl bag made for marine handhelds to try and protect it. My inadequacies in kayak handling were revealed in stark relief once we got out of Corson's Inlet and out in the Atlantic Ocean. I flipped the borrowed sit-on-top kayak on multiple occasions when hit by 2-3 foot waves in the surf zone. The AquaPac has a lanyard attached to it which I clipped to the boat, and it did not let so much as a molecule of sea water touch the radio. Kayaking in the surf is pretty physically demanding, by the time I was done I felt like I went a couple of rounds with Mike Tyson. At one point my buddy Bill noted that I had been towing the floating D72 behind my boat "like a buoy" for about a half mile. I was that tired, only thinking about the next paddle stroke. Tiredness aside, it was an awesome day and I really want to do it again! 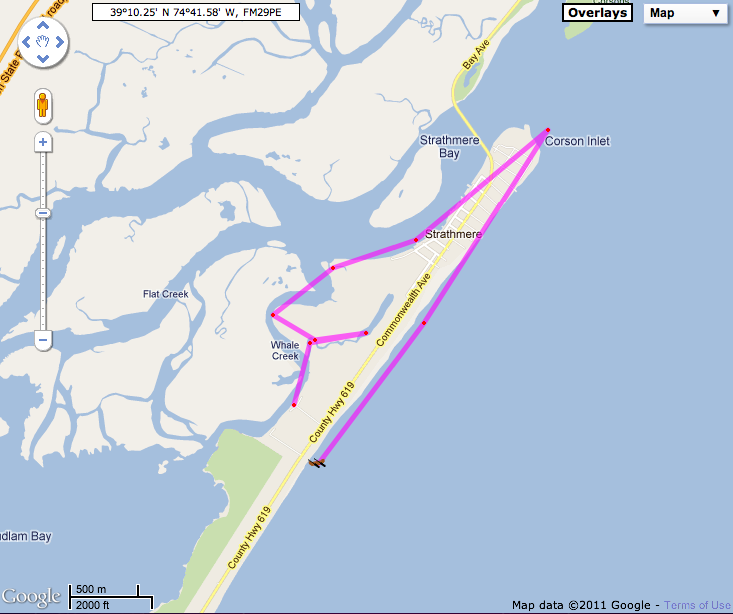 Here is the track recorded on APRS.fi, it doesn't look like much but it represents about 5 hours of paddling. Erika and I went down to Cape May today for a kayak eco-tour, which was excellent. Our guide was a PhD candidate biologist (who is defending his dissertation next month...good luck buddy!) and he was very knowledgable and chatty so I learned a lot about the salt marsh ecosystem. I provided comic relief by unintentionally stepping backward off the boat launch and going for an unplanned swim. Fortunately, the cameras had already been put away so that comedy went undocumented. After the kayak adventure we went to Cape May Point State Park so my wife could spend some (planned) time in the water. The concrete structure in the background is the remains of an artillery battery from World War 2. Along with the shore battery across the bay at Fort Miles in Lewes, Delaware (now Cape Henlopen State Park) they guarded the approach to the bay and ultimately, the Delaware river. Erika loves the beach, me not so much, but I did arrange alternate entertainment by bringing some radio gear and operating from the beach while she was in the water. I was using an FT-817ND transceiver and a Buddipole antenna (configured as a vertical dipole) along with a small solar panel to keep the radio charged. Murphy also tagged along, much to my chagrin. I set the Buddipole up for 20 meters according to the tuning guide in the manual but could not get the resonance point below 15.5 MHz. Tomorrow's project involves using my antenna analyzer to characterize the BuddiPole for my favorite frequencies and creating a tuning chart. Why the voltage regulator from the solar panel to the radio wouldn't work is a complete mystery; when I got home I tested the unit and all associated cables and everything was performing beautifully. Thirdly, my go-box is waaayyy too heavy, slogging across the sand with it was more of a workout than I cared to endure outside of the gym. We stopped at a store on the way home and I got a new camera bag for my DSLR and repurposed the old bag as my new 817 ops bag. I shed a lot of contingency items and stuck with the basics, with a considerable reduction in mass. It would have been nicer if the propagation on 20 meters had cooperated, but there was a lot of fading (QSB) and I was unsuccessful making any contacts using SSB. Next beach trip I'll use CW, hopefully with better results. With my Mom putting her house up for sale, I've started going through my Dad's workshop to start paring down the (large!) amounts of stuff. I found a kit that I had given my Dad for his birthday or Father's Day 10 or 12 years ago that he never finished. It's a Norcal 20, a 14 MHz single band QRP CW rig that was kitted by Dave Fifield AD6A circa 1999. I remember that the Norcal rigs had quite a following back in the day with the design emphasis on performance rather than minimal power consumption or "trail friendly-ness". 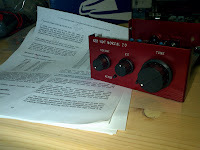 Dave's company was called Red Hot Radio and the kits had a distinctive red anodized enclosure produced by Doug Hauff W6AME at American Morse Equipment. 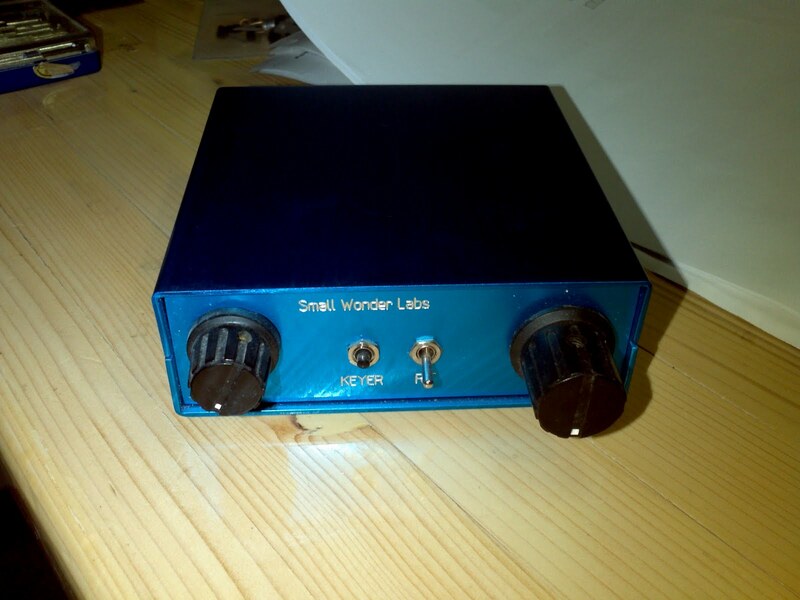 From a purely aesthetic point of view the Red Hot Norcal 20 will contrast nicely with Small Wonder Labs DSW-40 in it's blue Doug Hauff enclosure. The DSW-40 is a 40 meter CW rig that runs about 2.5 watts out with full break-in (QSK) operation. The big feature is the Direct Digital Synthesis (DDS) VFO with it's crystal-like stability. I'm not sure why, but the small kit market with it's affinity for single band radios is definitely a shadow of it's former self. In the late 90's and early 00's it seemed like there was a new single band radio kit every week. You had to monitor QRP-L (an internet e-mail reflector) for announcements because the kits would literally sell out in hours. Perhaps the decline is due to market saturation or competition from larger companies. I know that, for me, kit building has lost some of it's appeal. After a certain number of projects completed it comes down to a board stuffing exercise. I'm feeling an urge to design my own gear and do some scratch building but it probably won't happen until the cooler weather. A rainy Saturday spent sitting at the work bench tinkering is just a little slice of heaven. Fortunately for me my Dad was very detail oriented when building things, the assembly manual was in the kit box and I could see exactly how far he got by comparing the marked up instructions with the radio. I'll be able to pick up right where he left off. Collins 32V3 CW/AM transmitter now installed in the shack and powered up with no magic smoke discharge. Tomorrow I'll install the Collins 75A4 Receiver and hopefully get them on the air this week! I successfully avoided catching boat anchor disease until I visited with Bill Meara N2CQR and got a whiff of hot fire bottles in his shack. Then I started reading his book "Soldersmoke - Global Adventures in Wireless Electronics" and that put me over the edge. The nice part about ham radio, it's not an either/or activity. I can talk about satellite operations and home brewing QRP equipment on a 50 year old AM transmitter. There's not just something for everyone, but lots of somethings for everyone. After my Dad became a silent key in 2009, I had to begin finding homes for those radios of his that I couldn't use in my shack. A Heathkit DX-100 that he had built in the 1950s was one of the items I was conflicted over. I didn't want to junk it, or sell it on a certain well known auction site because it had been a fixture of my youth and had many pleasant memories associated with it, but I needed to find a home for it, preferably with someone who could enjoy it and bring it back to life on the airwaves. The answer presented itself in the form of Bill Meara N2CQR, diplomat, ham radio raconteur, and devotee of the fire bottle*. 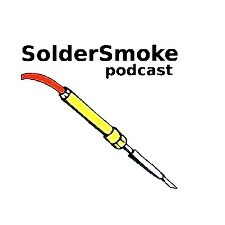 Bill produces and hosts a podcast called "SolderSmoke" where he discusses various aspects of ham radio home construction and "the Knack". As my father was gifted with "the Knack" and a fellow devotee of the fire bottle, and Bill had mentioned on a podcast episode that he regretted letting the DX-100 of his youth slip away, it seemed right that my Dad's transmitter should find a new home in Northern Virginia. My wife Erika and I drove down to Northern Virginia with the DX-100 and met Bill, his wife Elisa, his children Billy and Maria, and the newest member of the family, Capucco. Bill and his wife are consummate hosts and made us feel truly welcome in their home. A fortunate coincidence occurred when Erika and Elisa discovered they admirers of all things canine, which allowed Bill and I to spend an extended period in his shack talking radio without being missed by our wives. After touring his shack and equipment, Bill recorded some audio and video for his web page and podcast. It was really cool to be a part of the podcast and I came away inspired to take the next step from just assembling kits to building some radios of my own design. It was a magical afternoon. Bill while you received a new piece of equipment, you gave me the greater gift; the gift of peace of mind knowing that a cherished family heirloom will find new life on the air with an aficionado. Enjoy the DX-100, my friend. The firmware update for my Timewave DSP-599zx arrived and it was a painless installation, pop the old EPROM out, put the new EPROM in. The result has been a bit of a mixed bag, I seem to be getting some RF into the audio and the output signal is kinda crappy. Fortunately, I had a plan B in mind; by routing the "A" line level output into the SignaLink USB I was able to achieve most of what I was after. Most of the time having the entire audio passband going into the SignaLink works OK, just click on a signal in the waterfall and start decoding the signal. Sometime when there are two or three signals very close together the decode function in FLDigi (or any soundcard software) can get a little confused, but the PSK audio filters in the '599 allow me to dial down to about 35 HZ which isolates things nicely and allows for better resolution of closely packed signals. The only post installation issue is some RF getting into the powered sub-woofer that creates a thump in the speaker when I un-key but a few snap on ferrites should solve that problem. The install was a bit of a bear, I figured it would take an hour and actually took four, thus the nightfall picture. Well I seem to finally have escaped the winter doldrums and got back on the air. 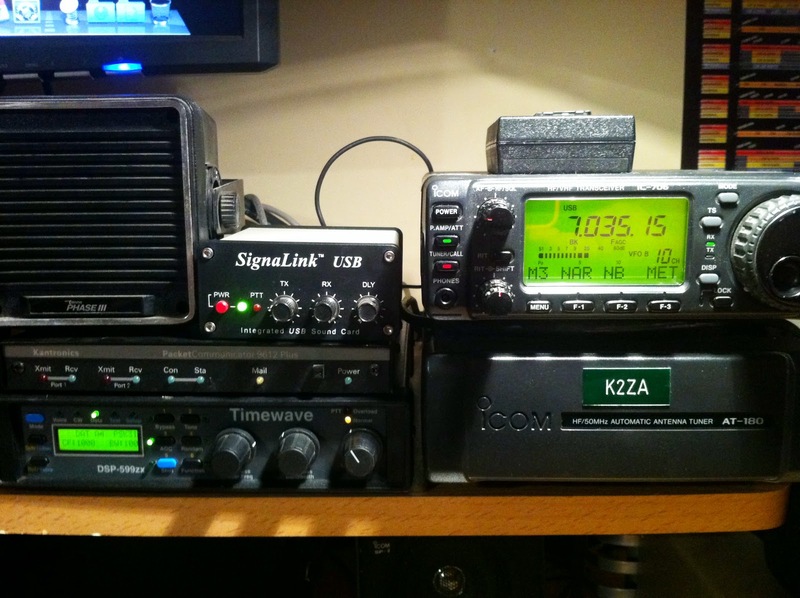 This is my PSK-31 station, with the exception of the speaker, the TNC, and the SignaLink USB adapter it all used to belong to my dad. A couple of months ago the IC-706 took a trip out to Toledo, Washington for MTS to fix a couple of very minor issues and give it an alignment. Scott did a great job at a very reasonable price and I would have no hesitation about using his service again. The radio is working like new and I've been on PSK-31 a lot. My only real complaint is the inability to switch in the narrow CW filter while in USB to narrow the front end but Icom didn't see a need for that feature 15 years ago when the rig was manufactured. To help the situation I just ordered a v5.0 EPROM for the Timewave DSP-599zx filter which will let me use it for PSK-31 service and act as the sound card interface. 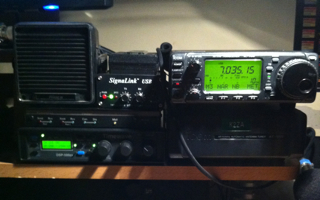 I'll move the SignaLink USB over to the Kenwood TS-2000 so I can run data modes there as well. The audio DSP filter won't be as much improvement as a DSP (or even crystal filter) in the IF of the radio but it should help considerably.